Are you currently using cut wire braze or picture frame braze for bonding the package frame to the base plate in your hermetic package assembly process? The Indium Corporation can increase your quality and/or reduce your lead times. How? : Capillary Blocks®. Using cut wire? The packaging manufacturing process offers numerous opportunities for cut wire to move during the process. The simple act of placing the package assemblies on the furnace belt can cause the wire to move - creating a defect. We worked closely with our customers to help them decrease rework and speed up the overall process. The result is the new Capillary Block®. The Capillary Block® is square in cross-section. This allows it to sit tight in the joint. 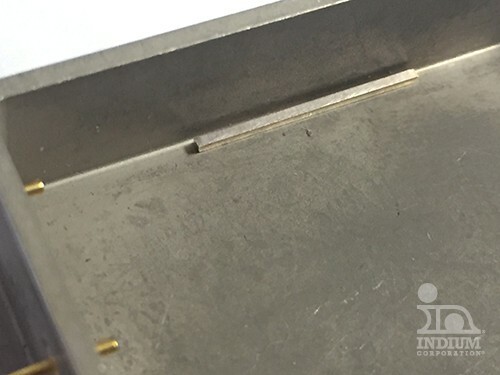 Additionally, this enhances the capillary action during reflow, directing more of the braze into the joint, assuring a higher quality hermetic seal. Using picture frame preforms? Many manufacturers use picture frame preforms. A major drawback to frame preforms is lead time: the initial setup of the tooling for new designs can take weeks. With Capillary Blocks® there’s no tooling required so lead times are much quicker and more cost effective. These benefits (increased first-pass yield, increased quality, increased value-added time, improved lead time) all combine to enhance your company's brand. They help build your reputation as a company who builds it right the first time and who delivers quickly. Capillary Blocks® are square in cross section: typically .030” width x .030” height. Their length is dependent on the amount of braze needed for the joint, and on your design. Lengths range from .250” to 1.50” - to fit your application. Learn more about Capillary Blocks®, or any of our braze products, by contacting me directly: bleavitt@indium.com.